Well, this is interesting. The website TMP reports the premier birther event of the year was scheduled for later this month in Arizona but was cancelled due to poor ticket sales. TPM calls it Birtherpalooza. The freakshow promised entertainment from 1950’s crooner and birther Pat Boone, warbling oldies from a bygone era. Event planners said Boone would appear with racist Arizona Sheriff Joe Arpaio and some of the nation’s other prominent conspiracy theorists. The Sept. 22 event was meant to bring people together from across America who believe President Barack Obama’s birth certificate is fake and rendering him ineligible to be president. 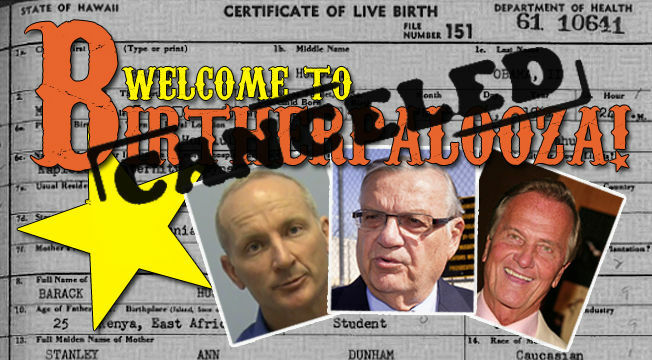 Event organizers planned to use Birtherpalooza to call on the U.S. Congress to take up Arpaio’s yearlong investigation into the documents. News of the cancellation means Birther queen Orly Taitz is now on suicide watch. This entry was posted in Arizona, Birthers, News, Republican Lunatics and tagged Arizona, Birthers, News, Republican Lunatics. Bookmark the permalink. What the hell happened to Arizona? My grandparents retired there back in the 1990s and it was evenly split Democrat/Republican and I don’t recall any extremist presence there whatsoever. It’s a sad day for America when hate groups take over the body politic. I personally believe much of this Tea Party/Birther nonsense there stems from Gov. Jan Brewer. I think you hit the nail on the proverbial head, Insouciant. Jan Brewer harbored racist, lunatic views when she was Lt. governor. With Big Sis the head of Homeland Security, Brewer was unleashed. The population of AZ has changed. Many more Hispanics and Asians. The old white guard don’t like or want this change. They’re holding on to a dying America. For a small but vocal demographic in this country, the notion of an African American president is more than they can accept. I’m with Fran. After short form and long form birth certificates proving Barack Obama was born in the American city of Honolulu, they continue to cling to the belief he’s a foreigner. They’re crazy and need mental health services immediately.